Going to the pumpkin patch every October is - hands down - one of my favorite traditions. We took LL for the first time when she was 9 months old, and we've gone every year since. 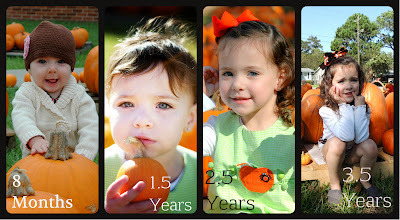 You can see our trips from past years: 2009, 2010, and 2011. 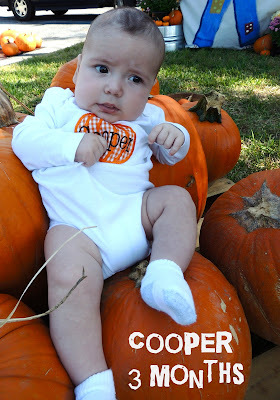 This year, I was PUMPED that we had Cooper to go with us! I made sure that they had their outfits in plenty of time for us to go. :) I'm glad that I snapped some pictures of LL and Cooper together before we left because I didn't get one of them together while we were there. I had to get some of just my handsome boy! And some of just my best girl! This year we went to the pumpkin patch at Park Ave because that's where LL goes to school. She's been passing by it every morning when Daddy drops her off and she has been wanting to go SO BAD. When we got there, she took off! There was a local news reporter there and they asked us if we minded doing a quick interview. Um - duh. Of course not! We had a friend who was working at the patch, so I handed my camera to him. Daddy's turn to talk. They just asked him about our traditions, if we do the pumpkin patch every year, what we do with the pumpkins (carve them, pain them, etc), etc. She didn't last long before she took off for the pumpkins again! We have a TALL girl! These next two pictures were per her request. I was nervous about this! I looks like Coop was, too - haha. Not bad for 3 months. 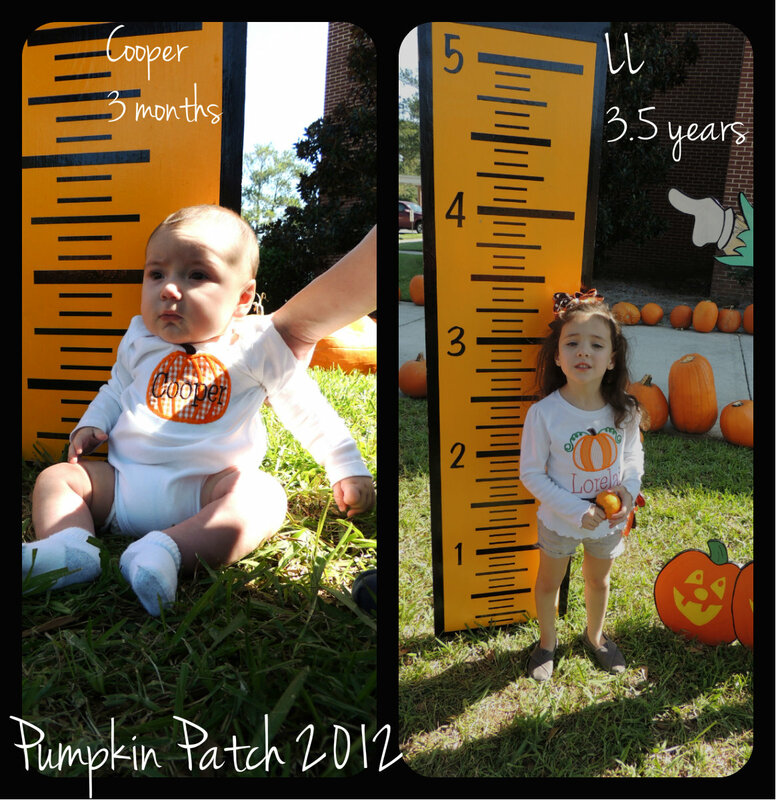 :) Hopefully he'll be a tall one like his sister! She has been a Daddy's girl lately, for sure! I really do LOVE going to the pumpkin patch every year. I can tell you for sure that we will be doing this for many years in the future! I love all of these pictures!!! 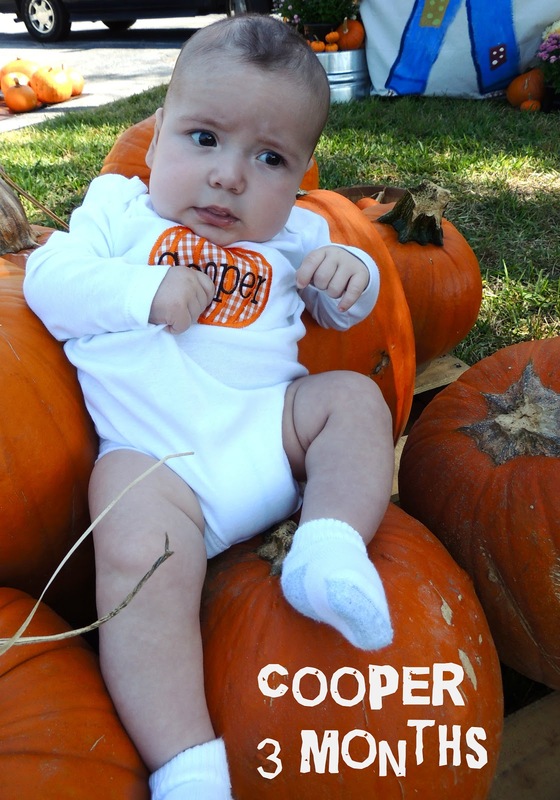 Cooper really is getting cuter and cuter:) I am glad to know some local celebs now! LOVE the family pics of yall! LL looks precious and so happy!